Real friends- These are people that are a friend through and through. They stick by you when the times are bad, they don't expect you to act perfect, they make sure you're OK when you aren't yourself. Real friends are a true find- when you find one (or many) you need to keep them. Virtual friends- This is my term for the people that you meet online, that you haven't met in person. Many of us have lots of virtual friends- we know them online, and we may know a lot about them- but chances are, we wouldn't recognize them if they were behind us in a supermarket line. Imaginary friends- These are people that can be either Real or Virtual friends, but what makes them imaginary is that they disappear. They may disappear from your life after a few days, or a few years. But, when things get tough or change, they don't stick around. You always won't know a friend is Imaginary- sometimes you think they're Real until they're gone. Over the last couple of weeks, I have learned a lot about friends. I learned that, sometimes, when you meet Virtual friends, they instantly can become Real friends. And, I learned the hard way, that people you think are Real friends, are actually only Imaginary. Real friends are hard to find- and when you do find a Real friend, make sure that you are a Real friend to them, and that you keep them in your life in whatever way works for you. Space Mountain. A ride that all Disney fans know, but few have seen in the light. As I recently discovered, you really don't want to see this ride in the light- especially from the top of the ride! One night at the Social Media Moms conference, a friend and I decided to skip the Joe Jonas and Demi Lovato concert and dash over to the Magic Kingdom to ride Space Mountain a few times before the park closed. After about 5 minutes, the lights came on. Of course, the first thing you want to do is look around. BAD IDEA! There was only one track higher than we were. We were almost at the top of Space Mountain. To the left side was a drop about 30 feet to a platform- which was about 40 feet. To the right side was a walkway that ended at the beginning of my train car and became a set of stairs. As I was looking around the inside of the ride, what struck me most was how gray everything was- the tracks, the rails, the stairs, the ground (far, far away)... I also never knew that there is an elevator in the middle of the ride to the top of the tracks. Several cast members made their way to all the cars on the ride and let all the people off- except for my friend and myself. Why- well, because of those stairs, we would have a large step down, which they wouldn't let us do. It wouldn't look good if we fell trying to get off... So, after several minutes, it was decided they would call the Fire Department to come get us off the ride. And yes, I am serious. While we were waiting, we both got our cameras out and started taking pictures. Unfortunately, it still wasn't light enough for my camera to take great pictures. When the Fire Department arrived, we were both slightly disappointed- we had asked for cute firefighters and Disney didn't deliver. Oh well. In a somewhat anticlimatic rescue, we slipped a strap under our arms and, uneventfully, climbed out of the car. We walked ALL the way down the many, many steps and left the ride. The best part of the evening- other than just getting off the ride- was being able to walk out of the Magic Kingdom a half-hour after closing. It was great to see Cinderella's Castle and Main Street without the throngs of people that are normally there. That being said, however, that wasn't an experience I wish to repeat. Friday was an amazing day at the Disney Social Media Moms conference. We knew it was going to be a great day when we walked into the conference room and saw each a Build-A-Bear on each table dressed as a different Disney Princess (we hadPrincess Tiana). Our first speaker of the day was Maxine Clark- Chief Executive Bear at Build-A-Bear. Maxine told us about how she grew her company and how she keeps it personal using social media. Maxine is a wonderful person, and her love for her company comes through everything she does. Following Maxine Clark was Marissa J Winokur, best known for her role in Hairspray and Dancing with the Stars. Marissa talked about how she uses social media in her career and getting her name out and into the public. Marissa is as bubbly in person as she appears on screen. After lunch, we had a surprise speaker- Kathy Ireland. Kathy shared with us what it was like for her getting her business off the ground and still being an involved mother. What impressed me most was during the question and answer session, Kathy was very honest and open with her answers- she wasn't handing out stock "feel-good" answers. Our last speaker of the day was Chris Brogan, author of Trust Agents. Chris is a social media guru, and really believes in what he talks about. At the end of the session, we got to enjoy the comedy of Mary Ellen Hooper. Mary Ellen had us all rolling on the floor with laughter. It was a great way to end the session. That evening, we were treated to a dinner and dance party in Studio Catering Company in the closed-to-the-public Hollywood Studios. As we ate and danced the night away, we got to mingle with Mickey and Minnie. Then, after dinner, we had an AMAZING treat- Disney opened Toy Story Mania for us to ride. Being able to just walk onto this ride and play was amazing. At one point, I was able to ride twice in a row without having to get off. After five rides, though, my arm was tired and I had to call it a night. Our speaker for the morning was Guy Kawasaki- founder of Alltop. Guy Kawasaki is a fabulous speaker. He spoke to us about how to effectively use Twitter to promote you and your business. And of course, like everything Disney does, the breakfast was amazing (even if we did only get one cup of coffee all morning). After breakfast, we went to a special celebration for Disney volunt'ears' and a special announcement. At the announcement, we saw several celebrities, including Carter Osterhouse (SWOON!). Disney had built the world's largest canned good structure, as certified by the Guinness Book of World Records. The big reveal was done by none other than Ty Pennington. After the big reveal, we were on our own in Epcot for a few hours. We got enjoy some of the rides and then a wonderful meal at Le Cellier. In the afternoon, we joined up with Lou Mongello of WDW Radio. Lou taped a live podcast with nine of us Disney bloggers at the conference (see the names, Twitter handles, and blog links below). It was an experience we will never forget! That evening, we were treated to a dinner prepared by Robert Irvine from Dinner Possible and a private concert by Joe Jonas and Demi Lovato. It was another AMAZING day by Disney, who proves they completely understand social media, and also that they know how to treat their guests! And here is the wonderful group of Disney friends that participated in the podcast with me. If you don't already follow them- DO IT! The first day of the conference was Wednesday. After checking into the Polynesian and getting the AWESOME swag bag prepared for us, I met up with several other Disney bloggers, including Jackie Gailey, Traci Curth, and J.L. Knopp. We puttered around the Magic Kingdom for a little while before we headed back to get ready for the evening's fesitivities at ESPN Wide World of Sports. We were treated to a presentation by Meg Crofton and several other high-level WDW executives who went into details about "What's Next, What's New". The biggest excitment was generated by the annoucement that the Electric Light Parade would be making a comeback this summer at the Magic Kingdom. It will have both familiar floats, as well as some new favorites. There will also be a new drop sequence for the Hollywood Hotel Tower of Terror and a new summer fireworks show at the Magic Kingdom. After the annoucement, we were treated to an amazing party. There was TONS of amazing food, character greetings, and dancing. I got to meet many of my personal celebrities, including Laura Spencer, Leanne, and Lou Mongello. Let me tell you- Disney sure knows how to throw a party! We partied and ate until we were ready to go back to the (amazing) Polynesian resort and rest up for the next day of the conference. Wow- this last week has been something for the record books- literally! We had the second-largest snowfall EVER in the Philly area on Friday and Saturday night. We topped out at the house at just over 20". Let me tell you- shoveling 20" of snow off the driveway, walkway and cars is a workout in itself! Not to mention the walking up and down sledding hills in that much snow. Matthew loved the snow- me, I was pretty anxious about it for a while. Normally, I love snow as much as anybody else, and flight cancellations and delays don't cause me much panic. However, the Disney Social Media Moms conference is scheduled to start on Wednesday, and my mom is scheduled to fly into Philly on Monday to watch Matthew for the week. So- I was carefully watching the weather and the flights and panicking. Luckily, after the snow (finally) stopped, the sun came out and flights started moving in and out of Philly. Ok- it looks like that crisis has been averted. So, at this point, it sounds like all is good- right? HAH! Looking at the extended weather forecast, it showed ANOTHER snowstorm coming into the area on Wednesday (the day I'm suppose to fly out). There is nothing that will keep me from this conference, so I started looking at options. Luckily, USAirways was fabulous! I called them and told them where I was flying out of and when, and they switched my flights so I can fly out on Tuesday- with no hassle and no charge! All it took then was a quick hop on Expedia to book a night at Disney's Pop Century Resort and I am good to go. 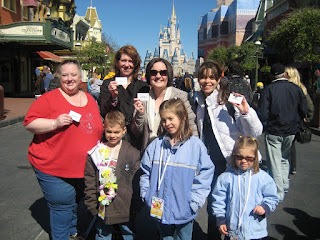 So- in two days time, I will be arriving in Orlando for the Disney Social Media Moms conference. I am so excited about this, and can't wait to start sharing what I have learned!